Oh my, nothing really compares to vegetables in August and September. In particular, early autumn brings the peak of heirloom tomatoes. 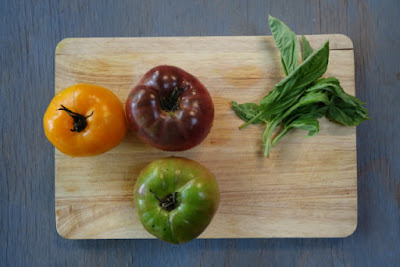 I adore heirlooms and find they should be showcased and the center of the dish that is being created. We've also taken a liking for Burrata this summer, so I mixed the two to create a lovely side salad. It's recommended to purchase them and enjoy within a couple of days and always store them at room temperature.